Choral music and music for voice is Berry's special interest, and she aims to portray in music, the people, environment and lifestyle of the area where she lives. 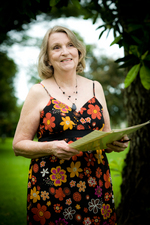 Rhonda Berry lives at Bramston Beach, Far North Queensland, where she is a private piano teacher and accompanist. Born in Cairns, she has lived and been involved in the music scene in North Queensland for most of her life. Music composition is the area of music where she has been most involved since her graduation from James Cook University with a BA degree (music composition) in 1997. Her music has been performed in 2008 International Congress on Women in Music, Beijing (China), at the ISCM 2005 World Music Days, Zagreb (Croatia), a concert in Nürnberg, Germany, and at the Jihlava Choral Festival. Works performed overseas include a composition for flute at the Kalvfestival, Sweden, in August 2009, a choral work, Communion, in Wellington, NZ, in 2010, and piano works Shades of Green and Trivet in Nürnberg, Germany in 2010. Australian performances include songs performed by students in Townsville in recent years, a soprano solo So true is my love by Helen Schaffer for her L.Mus.A exam, a string quartet With Magic in Cairns in 2008, a song cycle In the Garden at the 2008 North Queensland Concerto and Vocal Competition, Townsville, and a piano work Country Life, performed in Cairns by American pianist, Roman Rudnytsky, in May 2008. In 2014, In the Garden featured in the program of Serendipity in Brisbane. Two of these songs have recently been published in Voices of Australia II (2014). A thesis on her piano music was written by Magda Cyran, Germany, in 2003. This thesis has now been translated from German to English with funding from the Sophie Drinker Institute, Germany. Currently she is represented in the library of Archiv Frau und Musik, Germany, and the library of the Australian Music Centre. Choral music and music for voice are her special interest and she aims to portray in music the people, environment and lifestyle of the area where she lives. Words by Australian poets feature largely in her repertoire. Trivet : for piano (1996) This work was written especially for the Dorothy Ransom Prize competition. Book: Rhonda Berry : an introduction to her works and an analysis of selected compositions for piano / Magdalena Cyran.